See: Tayler, Roger John (1994). The Stars: Their Structure and Evolution. Cambridge University Press. p. 16. ISBN 0521458854. ↑ 9.0 9.1 Adelman, Saul J. (July 8–13, 2004). "The Physical Properties of normal A stars". Proceedings of the International Astronomical Union. Poprad, Slovakia: Cambridge University Press. pp. 1–11. สืบค้นเมื่อ 2007-07-03. ↑ From L=4πR2σTeff4. See: Tayler, Roger John (1994). The Stars: Their Structure and Evolution. Cambridge University Press. p. 16. ISBN 0521458854. ↑ 16.0 16.1 16.2 Liebert, J.; Young, P. A.; Arnett, D.; Holberg, J. B.; Williams, K. A. (2005). 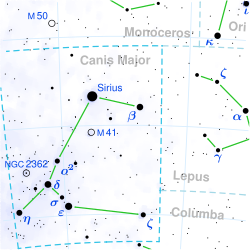 "The Age and Progenitor Mass of Sirius B". The Astrophysical Journal 630 (1): L69-L72. ↑ Richard Hinckley Allen (1899). Star-names and Their Meanings. New York: G. E. Stechert, 117. หน้านี้แก้ไขล่าสุดเมื่อวันที่ 13 มิถุนายน 2560 เวลา 15:30 น.